Expanding on a subject subject by subject can be tedious if the learner has to go from one slide to the next in a linear fashion. With this incredibly easy method, you can turn any presentation into a fully navigable hotspot interaction. You can download the full package here. 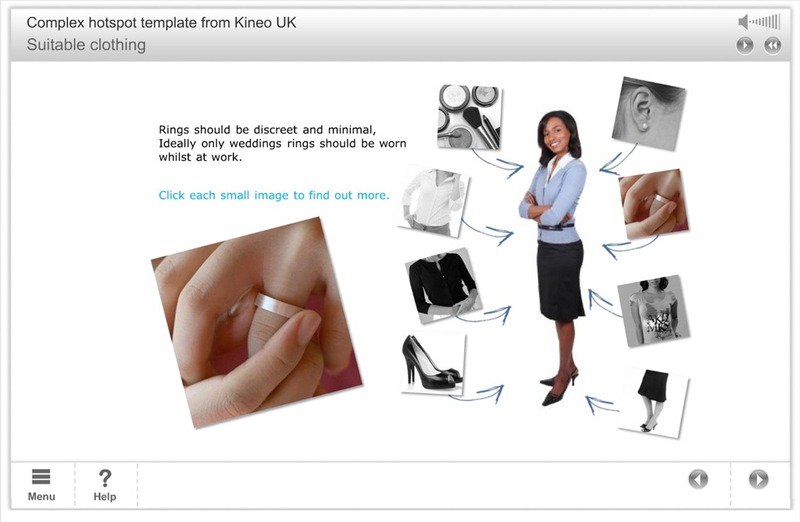 The ppt contains 9 slides with a central image and 8 images placed conveniently around it. Each one of those images is a separate graphic whilst the woman of the arrows and the woman have been placed in the Slide Master to make it easier for the slide to be duplicated and remain consistent. Once you have your Slidemaster ready, this is a step by step guide to creating these hotspots. In the first slide place the images around the central photograph and set up the layout that will be repeated on the next few slides. Create as many slides as hotspots you need to have. In this case, 8. this will mean you’ll have one more slide than the number of hotposts. One slide for the initial layout and one for each one of the hotspots. Select “Place in this Document” on the left pane. You will get a list of the slides you have. In this list, select the slide you want this particular image to link to. Repeat the process with every image you want to convert into a hotspot, being careful to link to the right slide. Go to each slide and paste the images (Ctrl – V in PC, Cmd –V if you use Apple computers). They should all appear in exactly the same place of the originals, so if you flick from slide to slide, you won’t see anything moving. Each slide should have the description for a particular image. Select all the hotspots, but leave the one the slide corresponds to untouched, and then apply a B&W or a colorize effect by right clicking and going into “Format Picture” at the bottom of the menu. Then repeat that step for each slide. When you have finished you will have a fully interactive hotspot. Now is just a matter of adding the relevant information and text about the topic in each slide, publish, and wait for the compliments to come! This entry was posted on November 26, 2010 at 2:57 pm and is filed under Articulate, Authoring tools. You can follow any responses to this entry through the RSS 2.0 feed. You can leave a response, or trackback from your own site. Thank you for sharing this! The basic form is ideal for any interactive training. This is helpful – what I usually do, is add all the B&W pictures to the slide master as well. That way these don’t load afresh each time. For every hotspot slide, I then just add one new colorised picture overlapping the original B&W. That avoids the refresh that you’re getting when you click some of the images. That is indeed a very good way to save some time, but if you’re not going to have animation in the hotspots or change the position somehow to show that what hotspot has been selected. If you decide to add any sort of movement or effect other than changing the colour of the image, then it will probably look weird and out of place.